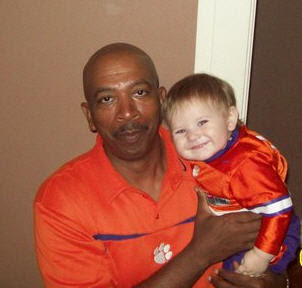 Caroline was a Clemson fan before she was even born. Clemson traditions are deeply rooted in her family. Born and raised in the small town of Edgefield, SC, Caroline has probably been to every Clemson home game since the day she was born. Caroline is the girl you take to parties and make bets with the gentlemen there that she will know more about Clemson sports than they will - and she always does. Caroline can rattle off Clemson sports stats faster than you can say your own name. Ask her any question about Clemson sports, past...present...or even future... and she will know the answer. She attended Clemson and graduated in 2002 with a degree in History and a minor in English - but her lifelong dream is to be a college sports reporter for ESPN. 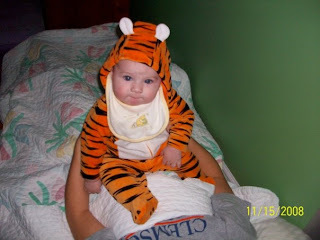 In June of 2008, Caroline gave birth to her very own "Tiger" cub - a future Clemson sports star, born at a VERY healthy 11 pounds! 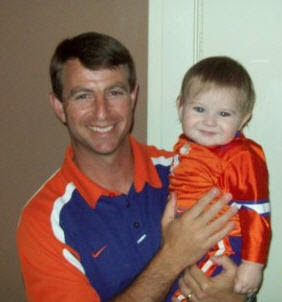 He is just shy of 11 months old and he's already had written offers from both Coach Dabo and Coach Oliver. Caroline has joined the Clemson Girl team as our very own Clemson sports reporter. All year round, she'll be giving us her sports predictions, recaps of the games, her favorite Clemson sports memories, and so much more. Caroline wants to give all Clemson Girls, who are just as sports crazy as she is, a place to have conversations about Clemson sports. Stay tuned to the blog for Caroline's sports posts - her very first will be later this week! We hope to make ClesmonGirl.com the place where Clemson Girls can voice their opinions and thoughts about anything Clemson sports-related....and be heard loud and clear! 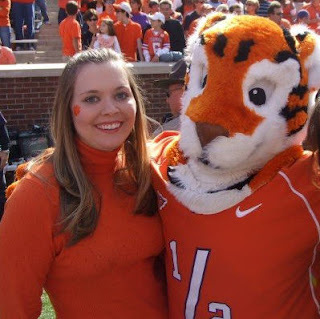 ClemsonGirl.com Contest: We would like to give Caroline's regular posts a catchy name - please submit your idea for what her posts should be called by either commenting on this post or by emailing us at clemsongirlblog@gmail.com. Make sure you include your name and email address (we will not sell or reuse your email address in any way). If we pick your name, we'll announce it in Caroline's first blog post along with your name and send you a free Clemson prize!! Caroline will be PERFECT for this job! I have seen her in action & she does know A LOT of Clemson sports facts!!! Congrats Caroline! Yay! I can't wait to see Caroline in action.